Americans buy more pickup trucks than any other type of vehicle, so boosting their efficiency can have a significant impact on overall fuel consumption. And since trucks--especially full-size ones--start out with relatively poor fuel economy, even small increases can add up to much more significant amounts of fuel saved, compared to slightly increasing the fuel economy of the most-efficient cars. In recent years, manufacturers have also had to consider stricter fuel economy standards, and have steadily improved their trucks' efficiency to keep their fleet averages up. As we've done for the past couple of years, we rounded up the official figures to see which 2016-model-year truck from the Detroit Three automakers--Ford, General Motors, and Fiat Chrysler--is the most efficient on the road. 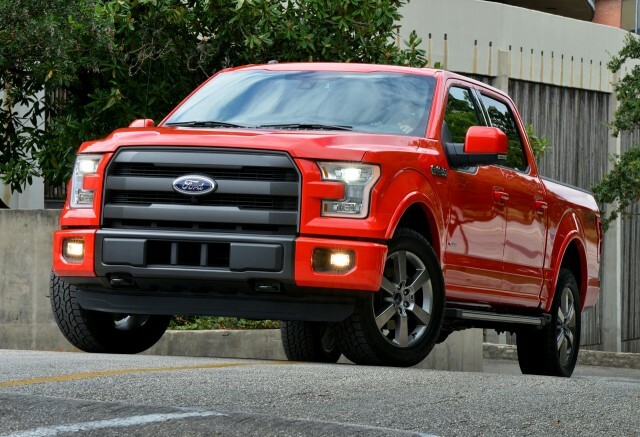 Last year saw some big changes, headlined by the arrival of the aluminum-bodied 2015 Ford F-150. Overall, changes for 2016 are smaller, but one key update has caused the fuel-economy crown to change hands. 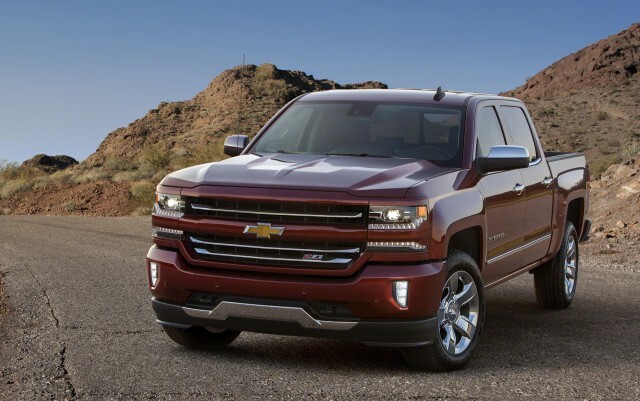 General Motors introduced the Chevrolet Colorado and GMC Canyon twins as 2015 models, but the addition of a 2.8-liter Duramax diesel four-cylinder engine option for 2016 makes them the most fuel-efficient new trucks available. The diesel engine is only available with a six-speed automatic transmission, and returns identical fuel-economy figures in both the Chevy and GMC. With rear-wheel drive, both mid-size trucks get 25 mpg combined (22 mpg city, 31 mpg highway), while four-wheel drive models get 23 mpg combined (20 mpg city, 29 mpg highway). The Duramax is one of three engines available in the Colorado and Canyon. 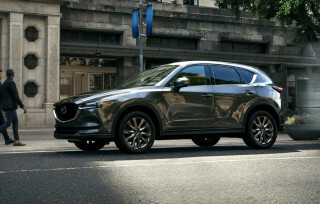 Base models get a 2.5-liter gasoline four-cylinder which, when paired with the six-speed automatic, returns 22 mpg combined (20 mpg city, 27 mpg highway) with rear-wheel drive, and 21 mpg combined (19 mpg city, 25 mpg highway) with four-wheel drive. The gasoline four-cylinder can also be matched with a six-speed manual transmission in the Work Truck model, which is aimed primarily at fleets. Available only with rear-wheel drive, this configuration gets 22 mpg combined (19 mpg city, 26 mpg highway). There's also a 3.6-liter V-6, which can only be had with the automatic transmission. It's rated at 21 mpg combined (18 mpg city, 26 mpg highway) with rear-wheel drive, and 20 mpg combined (17 mpg city, 24 mpg highway) with four-wheel drive. 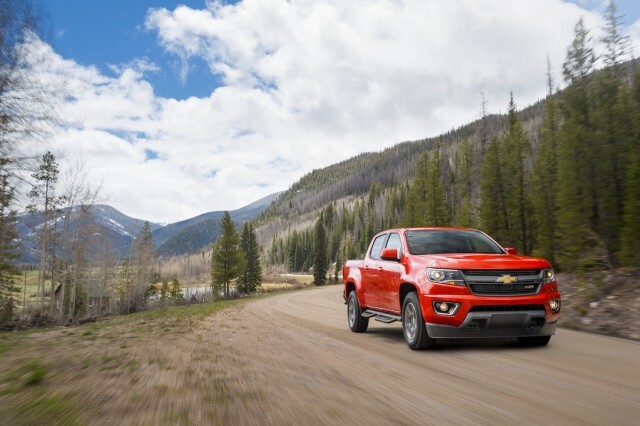 The V-6 lessens the Colorado and Canyon duet's fuel-economy advantage over GM's full-size trucks, the Chevrolet Silverado 1500 and GMC Sierra 1500. The two models are nearly identical, and earn the same fuel-economy ratings. The most fuel-efficient option is the base 4.3-liter V-6, which is offered only with a six-speed automatic transmission. It's rated at 20 mpg combined (18 mpg city, 24 mpg highway) in rear-wheel drive C15 models, and 19 mpg combined (17 mpg city, 22 mpg highway) in four-wheel drive K15 models. For 2016, the mid-level 5.3-liter V-8 gets an optional eight-speed automatic transmission, in addition to the standard six-speed automatic. C15 models get 19 mpg combined (16 mpg city, 23 mpg highway) with the six-speed, and 18 mpg combined (16 mpg city, 22 mpg highway) with the eight-speed. Interestingly, K15 models are also rated at 18 mpg combined (16 mpg city, 22 mpg highway) when equipped with the six-speed, while eight-speed models get 17 mpg combined (15 mpg city, 21 mpg highway). One last option is the 6.2-liter V-8, which is only offered with the eight-speed automatic. It gets 17 mpg combined (15 mpg city, 21 mpg highway)--in either RWD or 4WD configuration. For 2016, the aluminum-bodied Ford F-150 enters its second model year with some minor changes, but none related to gas mileage. The F-150 is still offered with 2.7-liter and 3.5-liter turbocharged V-6 EcoBoost engines, as well as a naturally-aspirated 3.5-liter V-6 and 5.0-liter V-8. With the six-speed automatic that's mandatory with all engines, the 2.7-liter EcoBoost is still the most fuel efficient, at 22 mpg combined (19 mpg city, 26 mpg highway) with rear-wheel drive, and 20 mpg combined (18 mpg city, 23 mpg highway) with four-wheel drive. The naturally-aspirated 3.5-liter V-6 gets 20 mpg combined (18 mpg city, 25 mpg highway) with rear-wheel drive, and 19 mpg combined (17 mpg city, 23 mpg highway) with four-wheel drive. Trucks with the turbocharged 3.5-liter EcoBoost V-6 are rated at 20 mpg combined (17 mpg city, 24 mpg highway) with rear-wheel drive, and 18 mpg combined (16 mpg city, 22 mpg highway) with four-wheel drive. Finally, the lone V-8 engine option gets 18 mpg combined (15 mpg city, 22 mpg highway) with rear-wheel drive, and 17 mpg combined (15 mpg city, 21 mpg highway) with four-wheel drive. Ford also offers a natural gas or propane prep-kit option for F-150 trucks equipped with the V-8. It's the only 2016 half-ton truck with this option. The Ram 1500 EcoDiesel may have been bumped from the top spot by the mid-size GM diesels, but it's still the most fuel-efficient full-size truck. Since we last did our truck fuel-economy survey, Ram added an HFE (High Fuel Efficiency) model that offers a slight advantage over the regular EcoDiesel. Available only with rear-wheel drive, it combines features from trim levels that Ram determined to be the best for efficiency. With the same 3.0-liter turbodiesel V-6 and eight-speed automatic as other EcoDiesel models, the HFE gets 24 mpg combined (21 mpg city, 29 mpg highway). That's a mpg increase over the standard, rear-wheel drive EcoDiesel. With four-wheel drive, the EcoDiesel is rated at 22 mpg combined (19 mpg city, 27 mpg highway). 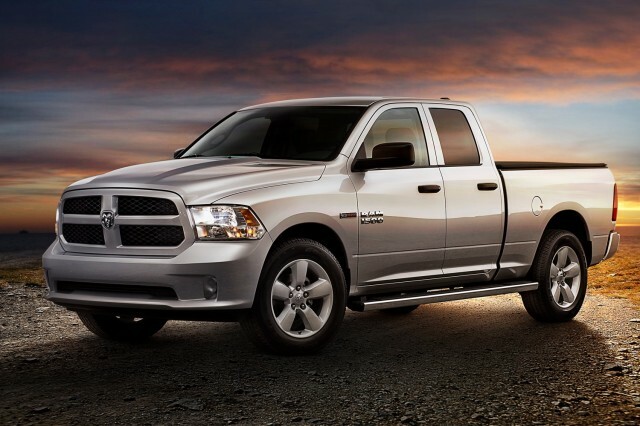 Ram also offers a 3.6-liter gasoline V-6. An eight-speed automatic transmission is also mandatory with this engine. Rear-wheel drive models get 20 mpg combined (17 mpg city, 25 mpg highway), and four-wheel drive models get 19 mpg combined (16 mpg city, 23 mpg highway). There's also a 5.7-liter Hemi V-8 that--with rear-wheel drive--gets 16 mpg combined with the standard six-speed automatic or 17 mpg combined with the optional eight-speed. 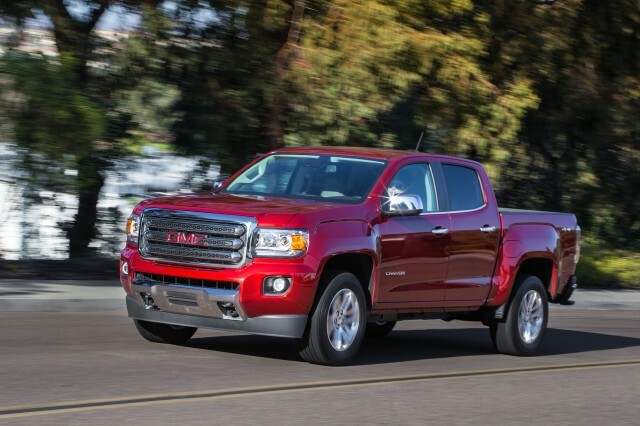 Four-wheel drive models get 17 mpg combined with either transmission.